Page bounce? Reload it. Different browsers can handle pages differently. We have price options for you. You can adjust the final total on the shopping cart because if you order in certain ways, it saves us some costs. And, we can pass that savings on to you! Why are we able to do this? If we are shipping you one container there are certain minimum shipping and handling fees we pay. If we ship you more than one quart or one gallon, those minimum fees are spread over more items and that results in lower pricing for you on the shopping cart. However, we do not want you to order too much. That is why we recommend your testing of samples first, then ordering approximately 75% of what you think the project will consume. You never know from an estimate what it will take. This way, the project itself shows you actual consumption and you can then order the balance needed to finish.
. Shipped from the warehouse closest to you.
. Shipped the same business work day if received by noon. Therefore, revising an order is many times not possible that same afternoon.
. If samples are included, the order will ship from Dallas. There is more information on the "checkout" page. Click the product picture for details including coverage guidelines. Orange label solvent base first. 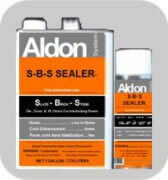 Water base sealers follow. Aldon Corporation and protected under applicable USA and international intellectual property law.